These 20 Easy Instant pot Dinner Recipes are the perfect way to make sure you’re family is fed on busy nights. “Instant pots” are all the rage. They are answering the collective prayers of people the world over trying to get delicious meals made quickly and with no effort. They are truly amazing because most are Multi-Functional Cooker that serve as a Pressure Cooker, Slow Cooker, Rice Cooker, Saute/Browning, Yogurt Maker, Steamer & Warmer. Meaning you get everything you could possibly wish for in one item. 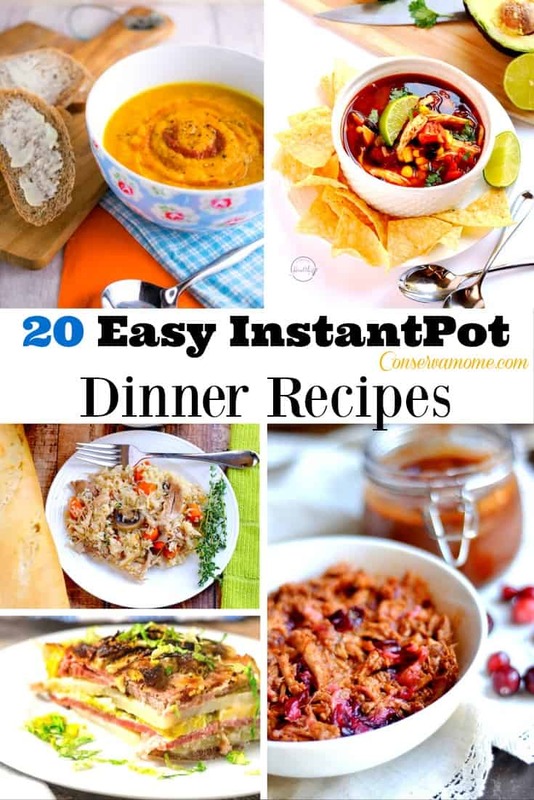 That’s why I have a round up of 20 Easy Instant Pot Dinner Recipes to make your dinner prep easier. Dinner is now a lot less stressful thanks to all these delicious ideas that will bring amazing. Still don’t have an Instant Pot? Click on the picture below and grab one at Amazon. *Contains affiliate link. chicken and lentil soup from SkinnyTaste.com. These look amazing, I am always looking for new easy recipes! Thanks! I need these recipes. Some days I just don’t feel well so I got to use my instant pot. These are great! So many options, I hope my toddler likes some of them. I’ve been very curious to use a pressure cooker and I think an “instant pot” would be a better investment for our family. I had not heard of them so I appreciate the information and recipes to try. I’m not really one for cooking. I don’t like it at all. So when I have to do it I want easy quick stuff. These look good! Oooo this is perfect. I always do pulled pork but this is perfect. I’m bookmarking this for trying out new recipes! Thanks for posting this. 🙂 Happy New Year! I want to try the Instant Pot Carrot, Squash & Harissa Soup. I really love these Instant Pot, multi-function cookers. Genius!! I’ve been wanting an InstaPot. These recipes look yummy! Thanks for sharing! The Instant Pot was on my Christmas wishlist. Someone didn’t get the message. Oh well, here I go to the store! Thanks for sharing all the recipes. I have a slow cooker, but I’ve never tried an Instant Pot before this would be a great item to have. I have never used a slow cooker enough, There are so many delicious recipes here. Thanks. I would love to have one of these appliances! It’s amazing what you can do with it. I never realized how many comforting and yummy meals would be so easy to make using a cooker like this. Great list of recipes. I am getting ready for my New Year’s Resolution of going low carb, and these recipes will come in handy. need to find out whats the deal with these? similar to a crockpot? big enough for family of 11? I all of these recipes look good and I have pinned some! I don’t have an Instant Pot but would love to have one. I use my crockpot at least 2-3 times a week! Thank you! Happy New Year! Yes I have been hearing SO much about these!! Now Im convinced I need one asap lol!! I’ll have to save these recipes for when I pick one up!! Yay for taxes coming soon!! I’m always looking for new recipes to try, they all look delicious! That’s a lot of things you can make in that little pot. I’ve always been interested in buying one.. now I’m even more leaning towards it.. I have never seen these before. The recipes look delicious and I love anything that makes getting great tasting ,healthy food on the table. I don’t know which to make first! They all look and sound so yummy! !